Whether you are looking to buy a new home or want to know if the electrical wire is safe in your home, here are some warning signs. If you notice a light flickering or hear a buzzing sound, this is a sign that something isn’t right. Even though your breaker might not trip, if you see these signs, have your electrical circuit checked out. Faulty cable splices, damaged or frayed wires, or cut insulation can be an extreme fire hazard and are often a sign of an amateur electrical job. A problem like this one often goes unnoticed. Frayed chewed up wires could be from rodents. Inspect the wall around the outlets. Do you see a discoloration or “burning” marks? By placing your hand next to the outlet, does it feel warm? Do you feel any vibration? These are some things to watch out for. If you smell a faint burning smell, or an odd odor, contact a professional immediately! It is common for a breaker to trip once in awhile. A breaker will trip as a safety caution when the system is overloaded. But if you notice the breaker tripping multiple times, it is time for a professional to inspect. Make sure there is a GFCI outlet near every place where you can have running water. Check your outlets near your sinks: are they GFCI? Push the “reset” button on the GFCI to prepare the outlet for testing. Plug an ordinary small electrical device such as a nightlight or a hair dryer, etc into the GFCI and turn it ON. The light or device should now be on. Push the “test” button of the GFCI. The electrical device should turn OFF. Push the “reset” button to turn the device back on. 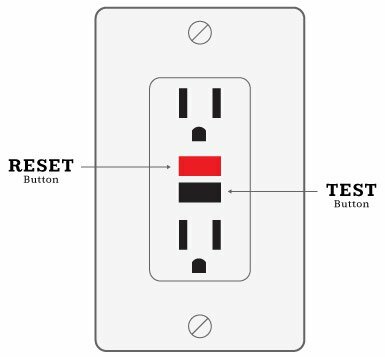 If your device does not turn off when you push the test button, your outlet is not working properly and you should call an electrician. If you don’t have a GFCI outlet in a wet location, call an electrician. Xenon under cabinet lights are an update of older Halogen lights. Halogen under cabinet lights, are usually the light “pucks” you see in hardware stores. They are inexpensive and provide color accuracy. However, they use a lot of energy, and the bulbs heat up.. Xenon keeps the benefits of Halogen, but burns brighter and cooler. Their color rendering makes your kitchen look it’s best. Xenon are brighter than Halogens, and save energy by using fewer watts than a Halogen bulb. Fluorescent under cabinet lights are a great choice if you are going for bright, energy-efficient lighting that burns cool. These are a very popular choice, because they don’t add extra heat to their surroundings. . However, fluorescent lights have relatively poor color rendering — 80 CRI to Xenon’s 100 CRI — so they distort colors and make granite and marble countertops and backsplashes appear washed out. These bulbs don’t work with dimmers, either. LEDs are the newest and most energy saving option for under cabinet lighting. Many people love LED under cabinet lights! Many LED models are dimmable which is a great feature. Unlike Halogen and Xenon, they also create very little heat. However, their color rendering isn’t the best and they can be costly. Their color accuracy really isn’t the best, They also have the highest up-front cost of any under cabinet choice but they will save the most in the long-term. LEDs use only a fraction of the energy consumed by other types of under cabinet lights. Even better, they last 20,000 to 60,000 hours, so you’ll never have to replace them and will save on bulb replacement costs. So there you have it J. Which one would you choose? And don’t hesitant to give us a call for questions, or if you need us to install your new under cabinet lighting! *Available in multicolor strands of 50 or 100 bulbs, and warm white strands of 50 or 100 bulbs). *Have a well made wire that doesn’t curl or twist and get tangled easily. *Available in warm white, multicolor, or single color in a variety of lengths and bulb spacings.